Anyone noticed there is an IDE to SATA brideg board bundled with ME1 if you bought ME1 recently. 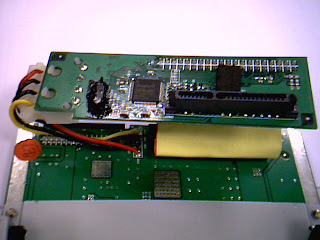 I managed to install the bridge board with my 750GB hard disk, see the pictures I took. It's quiet easy to install the bridge board, I'll take more pictures or even make a video to show you how. can this IDE adaptor be bought seperate for users who already have an ME1? emprex site isn't very imformative. does this mean i can fit a hd bigger than 500gb? I got mine today but there was no ide to sata converter with it! Can I buy any ide to sata converter? And will this allow me to put a 750gb sata hard drive in it? You can try to contact their UK sales manager for the adaptor. Thanks for that, I'll order one. I've had good kit from Hong Kong/China sellers, their reliable and cheap! I'll be keeping an eye out for the wireless dongle (hoping its 'N'). Even if it doesnt materialise well done Emprex. Don't forget to let us know if it fit in well. Looking at the one on eBay the molex connector is in the same direction as the IDE socket, the Emprex one has the molex connector at the side of the board, which will reduce the depth in the case. Can you let me know if the eBay will actually fit. Does anyone know where is definitely selling the newer bundled version? I just ordered one of these of Amazon on the 2nd February and it arrived 4th February with NO IDE to Sata converter. I think this is the most dissapointed I have been since getting a N64 game as a christmas present at the age of 14 which did not work. I only bought this device because I wanted what seemed a good device which supported my existing sata drive. (this was to stop me lugging my 17" Laptop to my girlfriends house all the time). What a waste of money!!! You can ask their local office to get a bridge borad or even buy it. To the person who put the ebay address for the adapater, it is not compatible with the ME1, I know because I have tried it. It is too big and will cause damage if inserted too harshly. The official one has the power connector on the side, it is the power connecter which makes installation too tight. As for the ME1 itself, it's a brilliant little machine. 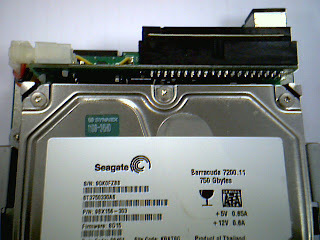 Scousemickey according to the ME1 v2 which is the one that has the converter it still states a maximum compacity of 500gb even for SATA so i guess it only offers a choice of connections opposed to more size. However they said that about my Iomega Screenplay and it took a 1000gb after a firmware update. Only way to find out is to install a spare if you have one. 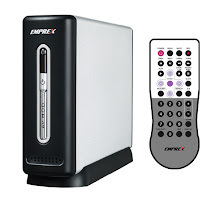 If I ever manage to source a proper converter from Emprex I will let you know. The ME1 also supports M3U playlist playback with a little tweaking of the files. This has been a feature that I have long awaited so I don't have to boot up my pc just to play music. To the guy who got one in february without a converter, you should have got it from play.com. They are doing the version 2 models which is the ones which have the adapter. Version 1 models do not ship with an adapter and version 2 models are slightly more expensive.